Fashion photographer Norman Parkinson is best know for his British glamour fashion shots. He did lots of work for Vogue and Harper's Bazaar back in the day. But I love how stylish these ladies are for golfing. Pleated skirts, jackets, turbans and of course sunglasses! Just fabulous! You might find it interesting to note that the first women's golf club was formed in 1867. Want to know more about the history of women in golfing, check it out here. 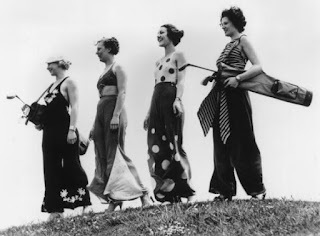 And our friend Fuzzy Lizzie has written a great post on the history of women's golfing clothing. FORE! 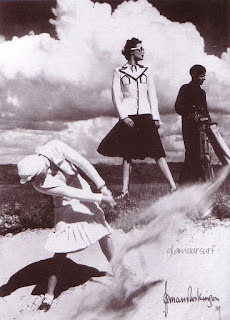 And just because I adore beach pyjama's here's another early golfing image.